Welcome to The A.V. Club’s Luke Cage binge-watch. From Friday, September 30 through Sunday, October 2, A.V. Club contributor Caroline Siede will be watching and reviewing every episode of the Marvel series’ first season.You can follow along and comment on the whole season on the binge-watching hub page or chime in on the individual episode reviews. For those watching at a more moderate pace, reviews by Ali Barthwell will run every other day beginning Monday, October 3. 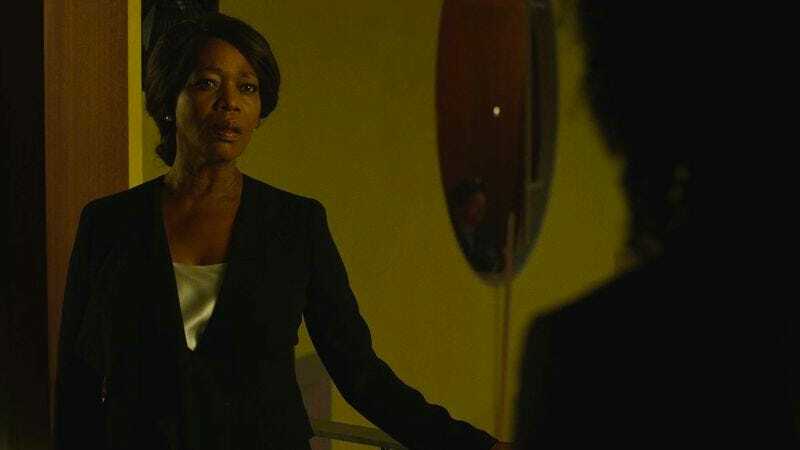 I was kind of trying to dance around this in my earlier reviews because I think Alfre Woodard is one of the most talented human beings on the planet, but Mariah Dillard didn’t really work for me as a character in the opening run of Luke Cage episodes. I could never quite get a grasp on her and I couldn’t tell how much of Woodard’s slightly more heightened performance was a character choice vs. a misunderstanding of the show’s tone. I’m revealing this now because I want to publicly admit that I was stupid to ever doubt Woodard: Mariah Dillard just might be Luke Cage’s secret weapon (literally and figuratively). Woodard is truly phenomenal in “Blowin’ Up The Spot” as she charts Mariah’s slow transformation from a woman shocked by her own crime of passion to a true queenpin. Killing Cottonmouth seems to have given her a new sense of confidence. She even drops her put-together politician act in front of Misty after she realizes the detective has nothing on her. But I think the most revealing scene is the one between Mariah and her patsy Candace. As I talked about in “Who’s Gonna Take The Weight?”, Mariah’s always viewed respect as the biggest key to power. Yet she counsels Candace not to worry about the fact that she lied to the police about her relationship with Cottonmouth and (in Candace’s mind at least) sullied her reputation. Ignore that, Mariah advises, and focus on the money that can get you a new life. “That’s power,” she explains. Has Mariah truly shifted her worldview and adopted a more Cottonmouth-like philosophy? Or is she merely offering Candace the advice most likely to keep her quiet? Mariah calmly informs Shades that if Candace starts to talk, they’ll just kill her and her entire family (“Shame… I’d hate to bring down the market value”). But she also rejects the idea that she’s anything like steely, vindictive Mama Mabel. In other words: Mariah is a complicated woman. But after getting more of an insight into her mindset, I find those complications fascinating rather than off-putting. Shades is another character I’m liking more and more as Luke Cage progresses. His clear enthusiasm at the idea of grooming Mariah for power is an interesting reaction to Cottonmouth’s death, although at this point I can’t quite tell how much he’s actually interested in helping her vs. simply placing himself in a prime position to take power from her. But either way, I’m looking forward to watching his machinations unfold. And I haven’t even gotten to the craziest part of this episode yet. Diamondback is here! And he’s Luke’s brother? I’m a little unclear on that last fact only because Luke seems so confused by the whole thing. But all of Diamondback’s dialogue implied they grew up together as brothers, so who knows. Maybe it’s a classic “Wolverine and Sabretooth in X-Men Origins: Wolverine” situation. Anyway, Erik LaRay Harvey commits to a very out-there performance as Willis Stryker. I think I’m going to need to spend a little more time with Diamondback before I can determine how well his heightened tone meshes with the show’s otherwise more grounded energy. His fight scenes in particular feel like a new visual language for the series. That’s partially because Luke is wounded and vulnerable for the first time, but mostly because Diamondback has a martial-arts based fighting style. Apart from a few wonky bits of CGI, the United Palace makes a stunning backdrop for the Luke/Diamondback showdown. And I like how long the show holds back on the reveal that he’s Diamondback. It makes Willis’ sudden appearance at the end of the previous episode feel a whole lot less random. And it raises a lot of questions about how much Luke has known about Cottonmouth’s dealings this whole thing. And I haven’t even mentioned the additional reveal that Diamondback is the one who got Luke sent to prison. When you’re probably about to die, but you also want a stylish winter look. Looking back, this episode raised a lot of questions and provided very few answers. But, to be honest, I’m a little too exhausted from my binge-reviewing to figure out how I feel about that. So let’s move in Luke’s favorite direction (forward) and see whether he’s really dead this time (he’s not). Standout moment: I’m really fascinated by the fact that the show has Misty Knight—by far its most moral character—commit an act of police brutality against Claire. I didn’t, however, love how quickly Diamondback managed to overpower her during his attack. It seemed weird that a trained law enforcement officer would get taken hostage so easily. Marvel Cinematic Universe connections: What did I miss? Burning question: Wait, did Claire use a pair of regular tweezers to examine Luke’s soft tissue on a cellular level? I have a lot of questions. Also raise your hand if you didn’t put together the fact that Cottonmouth and Diamondback are both names of snakes. Just me? Okay.